Ukrainian President Petro Poroshenko addresses the Armed Forces of Ukraine at the military airfield in Vasylkiv region, Ukraine, Dec. 1, 2018, as Poroshenko transferred new aircraft and military equipment to the Ukrainian Armed Forces. 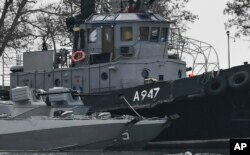 Ukraine's leader called on Germany and its allies to boost their naval presence in the Black Sea to deter Russia from further aggression in the region and said Russia was blockading Ukrainian ports on the nearby Sea of Azov. President Petro Poroshenko says Russia has deployed a large number of troops along its border with Ukraine. He alleged in an interview published Sunday that Russia intends to push inland into Ukraine following a clash in the Black Sea between the countries' forces. “We need a strong, unified, unambiguous reaction to Russia's aggressive behavior,” Poroshenko said in the interview published by Germany's Funke Media Group. Citing the imminent threat of a Russian offensive, Poroshenko convinced the Ukrainian parliament to implement 30 days of martial law. FILE - Damage on one of three Ukrainian ships is seen after they were seized seized in a standoff with the Russian navy in the Black Sea, Nov. 25, 2018, in Kerch, in Russia-annexed Crimea. During the naval clash a week ago, Russian coast guard vessels fired upon and seized three Ukrainian naval boats and their 24 crew members. The incident has driven tensions between Russia and Ukraine to their highest point since Moscow annexed Crimea in 2014. “Moscow is trying to create a land corridor from occupied Donbas to occupied Crimea by blockading Mariupol and Berdyansk,” Poroshenko said in the interview, referring to two Ukrainian cities on the coast of the Sea of Azov. Russia and Ukraine have blamed each other for the Nov. 25 clash in the Kerch Strait, which links the Black Sea and the Sea of Azov. During that engagement, Russia closed the Kerch Strait to all traffic. Ukrainian officials have since accused Russia of denying passage to Ukrainian commercial traffic in and out of Mariupol and Berdyansk.